This quiet unsung Canary Island is a visual masterpiece featuring deep ravines patterned with volcanic crags and enchanting forests shrouded in mist and bird song. 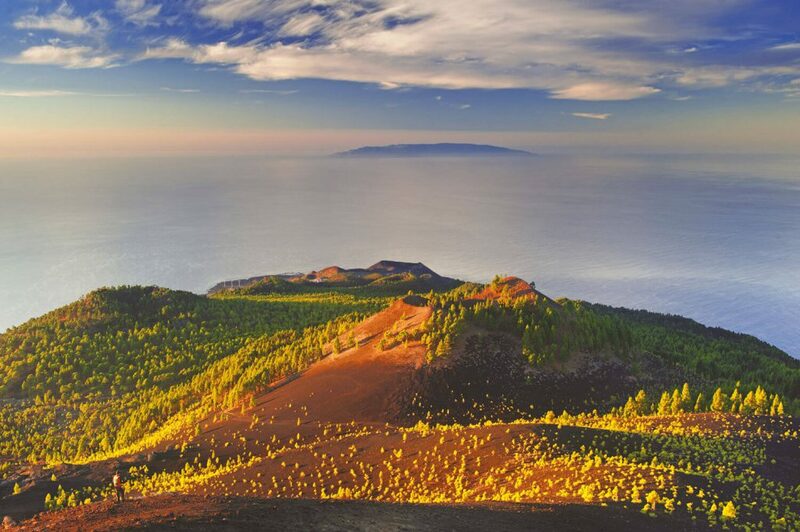 Due to its natural beauty it is no wonder La Palma is protected under a UNESCO Biosphere Reserve. But, believe it or not, its beauty extends beyond its landscapes on to its star filled skies, captivating capital and its inexplicable tranquil charm; ‘La Isla Bonita’ certainly lives up to its name. From paradise hikes to beachside retreats there are many wonderful things to do in La Palma. To help you plan your trip we’ve put together an ultimate guide to activities, sites and all things La Palma. La Palma is the least developed and most scenically spectacular of the Canary Islands. It’s stunning black sand beaches, dramatic volcanic ravines and untouched laurel forests make it an irresistible retreat. Just 4 hours from home and you could be relaxing in peaceful resorts with untouched beaches. 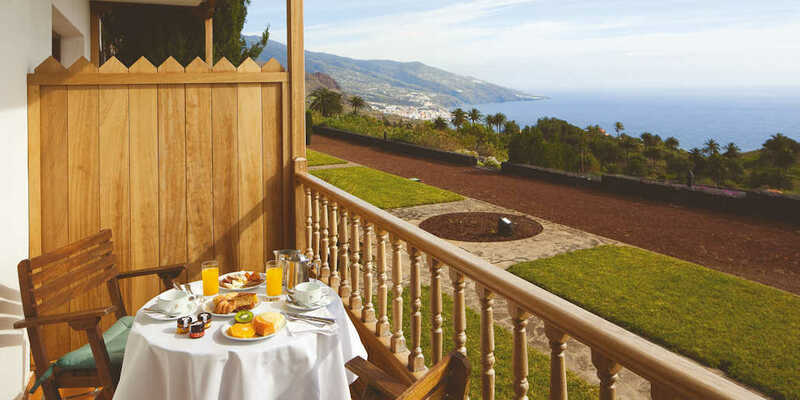 Visit our post for more reasons to visit La Palma. La Palma is the most north westerly of the Canary Islands located around 133km from Tenerife, meaning it experiences a similar climate. La Palma is blessed with some of the clearest skies in Europe, for that reason the skies are protected within a ‘starlight reserve’ and recognised on an international level for low levels of light pollution. From La Palma you can see a plethora of constellations and visit some stunning observatories built to view the sky above. 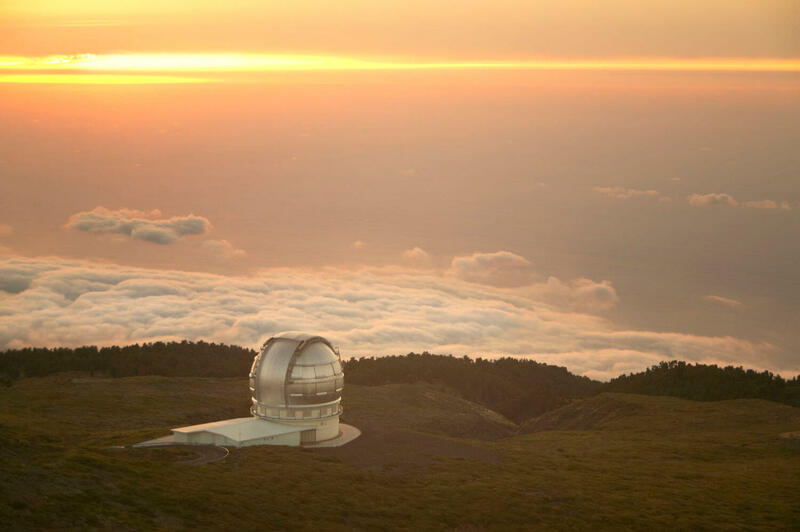 Two of La Palma’s observatories are set up by the IAC (Canary Islands Institute of Astrophysics) to study the night sky, demonstrating how phenomenal the skies here really are. Simply look up at night or view the stars from one of the many observatories, including Astro La Palma and Roque de Los Muchachos, where telescopes allow you to witness the surface of the moon, rings of Saturn or even Jupiter’s moons. There are several stargazing tours, walks and excursions taking place on the island. Admission to Astro la Palma from €9. 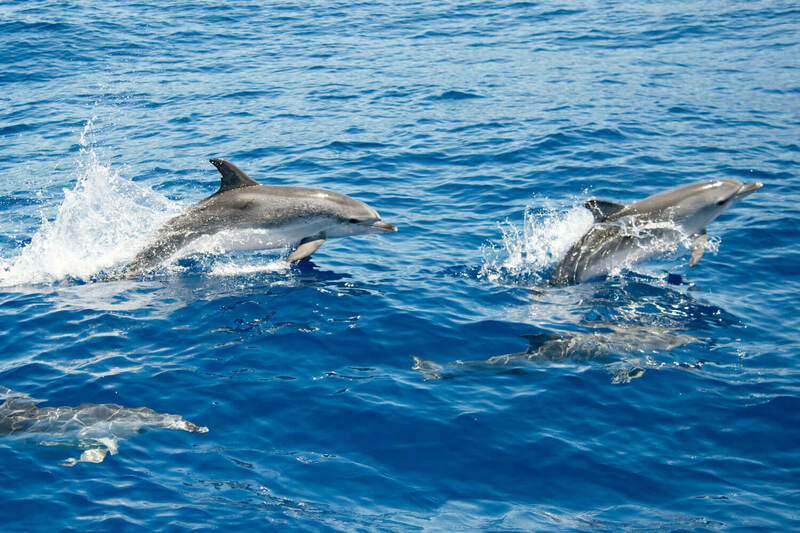 The Atlantic Ocean surrounding La Palma is home to a wonderful array of marine life including dolphins and whales. Several boat tours and catamarans operate across the island with experienced and knowledgeable guides, showcasing the beauty of La Palma’s marine life. Watch dolphins jump joyfully alongside your boat and witness the majestic sight of pilot whales coming up for air. 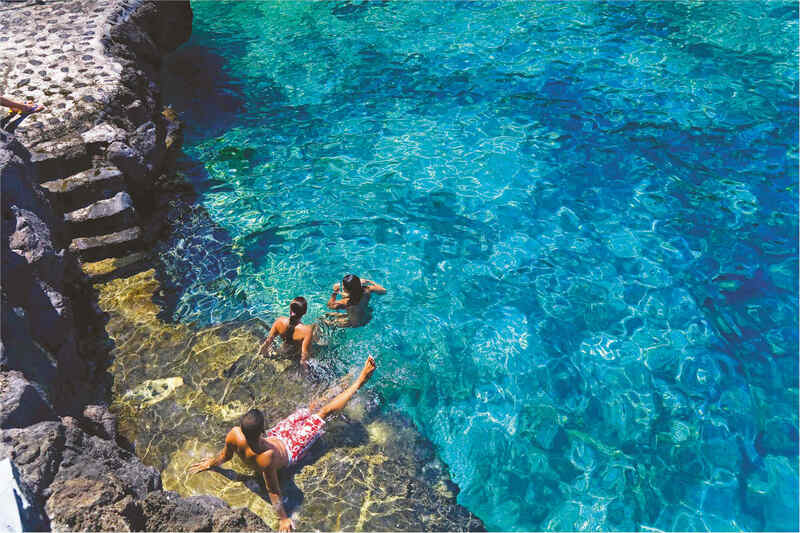 La Palma’s natural pools are filled with clear sea water making them a wonderful place to swim and a fantastic experience. Surrounding the pools are warm rocks in which you can sunbathe and relax, as well as toilet facilities and a small café. At Charco Azul there are showers to wash off which cost around 50 cents. Charco Azul and Piscinas de La Fajana are amongst the best natural pools on La Palma. Roque de Los Muchachos is the highest peak on La Palma offering jaw-dropping surroundings and views across the island. At the peak is a collection of 13 gigantic telescopes in which to discover, including the world’s largest telescope. The observatory is located on the edge of Caldera de Taburiente at 2,396 above sea level and can be visited throughout the year on a request basis. Open from 16th September – 14th June. Visits are only available Tuesdays, Fridays, Saturdays and Sundays. Open 9am – 12.30pm. Must be booked in advance. 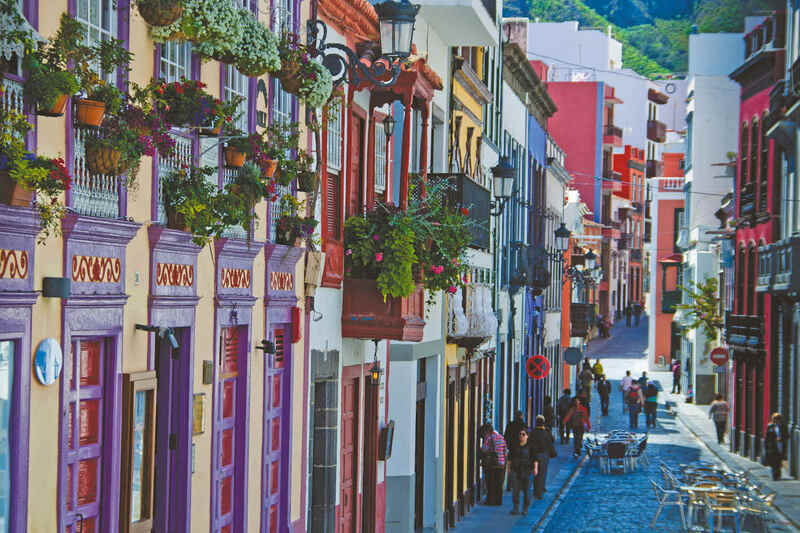 The capital of La Palma, Santa Cruz de la Palma, is a colourful and relaxed city, and a visit here is one of the best things to do in La Palma. Its 15th century buildings and flower filled balconies reflect the colonial era and its cobbled streets lead to quaint cafes and relaxed eateries. You can experience a delightful day trip here with plenty to entertain, including the colourful Avenida Maritima, impressive Iglesia del Salvador and tempting markets. Feel as if you have stepped back in time in the beautiful Old Town while soaking up the maritime atmosphere. Easily accessed by bus or taxi from all La Palma towns. At the most southernly tip of La Palma you will find the Salt Pans of Fuencaliente, one of the more unusual things to do in La Palma. Seawater is pumped in to shallow pools and left to dry in the sun resulting in natural salt formation. The salt is than packaged and sold in supermarkets across the island. 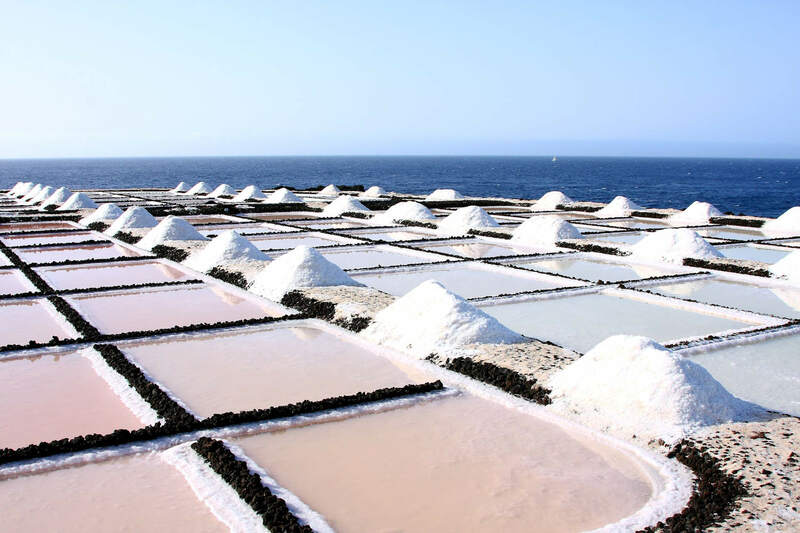 The view of brilliant white against black volcanic rock is an impressive sight, and although the operation is small, it produces 500,000 kilos of natural salt a year. Enjoy a charming forest hike and uncover the carvings of La Zarza, which occupy 29 panels, and La Zarzita, which occupy 18 panels. 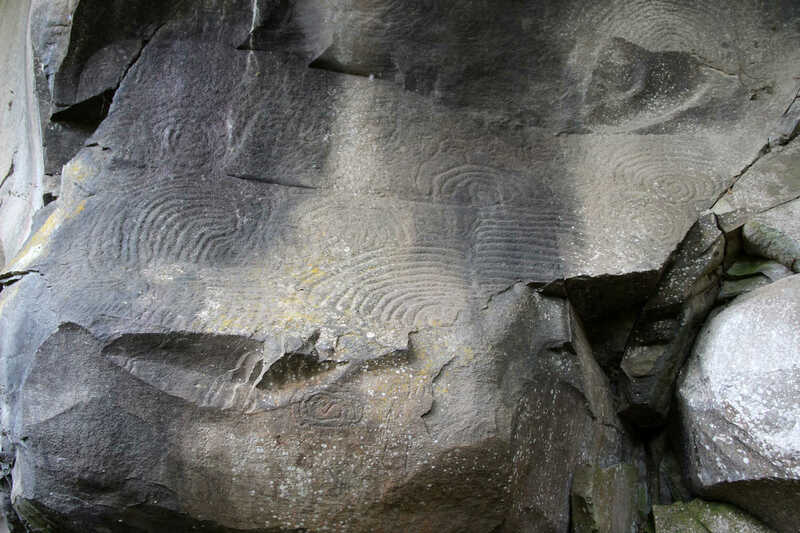 This fascinating site was discovered in just 1941, but the carvings and petroglyphs are ancient. The park is small yet fascinating with a small museum in which to learn the origin and theories behind the ancient carvings. Los Tilos Forest is one of the few remaining Laurel forests in the world, resulting in a unique experience. The walking trails here wind through misty glades to glittering cascades, taking in a fascinating array of flora and fauna along the way. 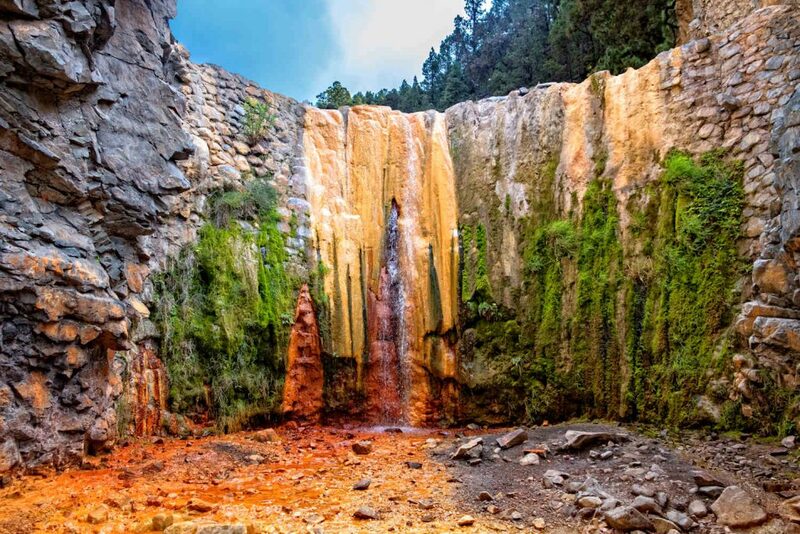 Don’t miss a visit to Cascada de Los Tilos, a stunning hidden waterfall. Caldera de Taburiente is a volcanic caldera formed millions of years ago, which is now a favourite with hikers. The vast national park is filled with streams, waterfalls and rugged peaks in which to walk through. Hike through dense forests, in to deep valleys and walk alongside the ridge of a volcanic crater. Within the park is the highest peak on the island, Roque de la Muchachos, the fascinating Cascada de Los Colores and an 8 km wide caldera. Cumbre Vieja National Park is situated in the heart of La Palma and home to extreme landscape contrasts, from green forests to barren volcanic crags. One of La Palma’s most popular hikes, known as the volcano route (Ruta de los volcanes), takes in the main sites of this beautiful park, including some of the oldest and newest lava formations, as well as a unique array of indigenous plants and animal species. 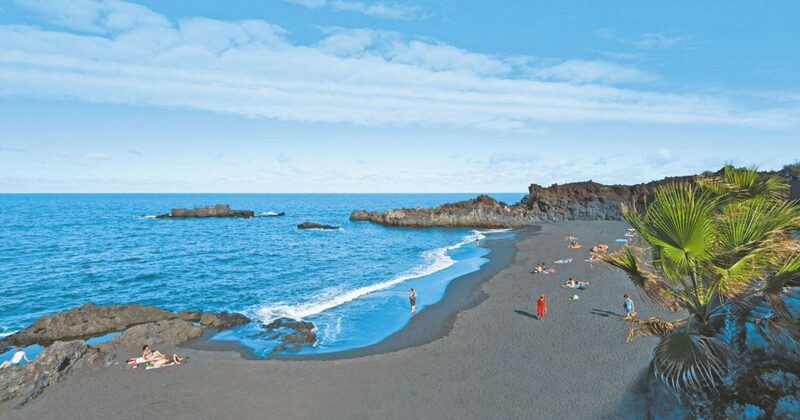 Due to their unique black sands and tranquil personality, La Palma’s beaches are simply wonderful. 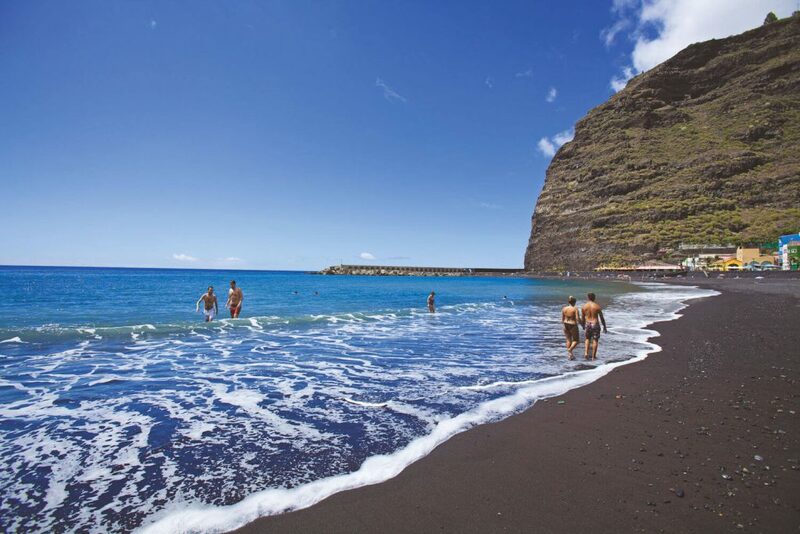 The black sands are created from the islands volcanic past and each beach is quiet, peaceful and utterly delightful. Thanks to being in a protected Biosphere Reserve, the waters a clean and clear, as well as featuring an azure glow due to the volcanic nature of the island. Make sure you bring a towel as the sand can get very hot. Puerto de Naos is a 600-metre-long beach with clean, clear waters and excellent facilities making it great for families and relaxation. Umbrellas are available for hire and there are kiosks serving refreshments, as well as a beach side promenade offering plenty of bars and restaurants. Puerto de Naos is located just 10km south of Tazacorte. Playa de Tazacorte is a 500-metre-long beach with blue flag status located in Tazacorte. The beach boasts lifeguards, changing facilities and great accessibility, as well as a promenade with bars and restaurants resulting in a relaxed bohemian vibe. A small section of the beach is reserved as a private nudist area. One of La Palma’s smaller beaches at just 250 metres long, Charco Verde stretches around a calm and shallow bay making it excellent for light swimmers. There are superb facilities, umbrellas and wooden walkways to protect your feet from the hot sand. Located 2km south of Puerto de Naos. Formed as a bay, Los Cancajos is protected by volcanic rocks resulting in tranquil waters throughout the year. Located on the east of the island, Los Cancajos has warm black sands, gentle waves, and calm waters. Similarly there are toilet facilities, showers and sunbeds for hire, as well as several restaurants nearby for refreshments. The Naval Museum (Museo Naval) holds a concrete reproduction of the Santa Maria (aboard which Christopher Columbus discovered the west Indies). The small museum demonstrates how Spanish conquistadors took sugar from the Canary Islands to Cuba. Open weekdays 10am – 6pm, weekends 10am – 2pm. Admission €4.50. Located in Santa Cruz. Discover the history of the famous Palmeran cigar and uncover the journey from tobacco cultivation to cigar production before a trip to the museum shop. Open Tuesday to Saturday 10am – 1pm. €3 admission, located in Brena Alta. Uncover La Palma’s long history of silk production dating back to the 16th century at Museo de la Sada. Witness the process of silk making from silk worm to fabric or enjoy your very own silk making workshop. Open Monday – Friday 10am-2pm, admission €3. At the Embroidery Museum you can witness some truly remarkable pieces of embroidery from throughout la Palma’s history, from table cloths and intricate cross stitches to fine embroidered silks. Open Monday – Friday 10am – 2pm and Saturdays 4pm – 6pm. Admission €2. Located in the red house in Mazo where the Corpus Christie museum is also located. Carnival Los Indianos: Taking place in either February or March, Carnival Los Indianos is a festival not to miss. The streets of La Palma fill with music, dancing and lots of talcum powder! Locals and visitors alike dress in white and throw talcum powder around the streets. La Bajada de la Virgen de Las Nieves: Bajada takes place in several towns across the Canary Islands, the term is Spanish for ‘bringing down’, meaning the bringing of the Patron Saint statue from its resting place to the people. In La Palma’s case, this is Virgen de Las Nieves (virgin of the snows). The festival takes place in July/August with several parades, pilgrimages and street entertainment. Fiesta de San Martin: This festival usually taking place in November where wine cellars open for visitors to celebrate the chestnut and grape harvest season. A great opportunity to taste local delicacies and wine. Fiestas San Miguel: An annual fiesta to worship the island’s patron saint, Fiestas San Miguel usually takes place in September. The streets fill with exhibitions, processions and unique celebrations, including the ‘dance of the Fufo horses’. 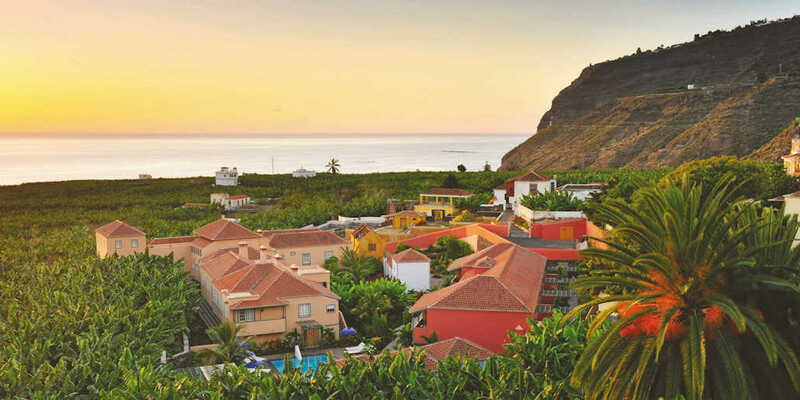 La Palma enjoys year-round, spring like weather and very little seasonal variation, however the best time to visit La Palma is from May to mid-October as the days are slightly longer. Temperatures are enjoyable year-round and the spring like weather is great for walkers, although the hottest months are July and August when the sea water is also at its warmest. 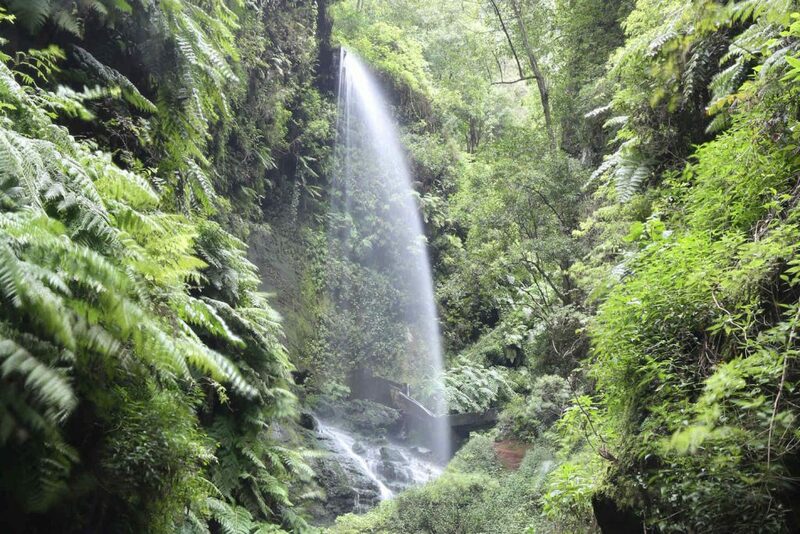 Rainfall is not particularly high in La Palma and falls most in November and December. La Palma follows the same time zone as the UK so there is no time difference. As part of Spain, the Euro is the only accepted currency in La Palma. 4 hours and 30 minutes from London airports. A wonderfully tranquil adult only hotel located near the historic centre of Tazacorte. This family run hotel is set in a converted 17th century mansion housing a fabulous collection of artwork from painting to sculptures. A hilltop hotel with jaw dropping views of surrounding countryside and the Atlantic Ocean. The hotel’s extensive gardens are ripe for exploring and the elegant facilities are perfect for relaxation. Just a 5 minute walk from the coastal town of Los Cancajos, this hotel boasts a peaceful paradise around its refreshing seawater pool and impressive botanical gardens.